The Ultimate Metronome with Speed Drill increases the beat while you play along, challenging you to improve your ability every day. All parameters are customizable, including time signature, speed increase amount, speed increase frequency, beat sample and accent sample. 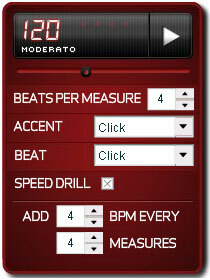 The Ultimate Metronome is just one of the many bonus features available to our Full Access subscribers. Free Download with your paid subscription.